When I was a 10 years old kid, a buddy of mine from Scouts told me about his High School. He was attending a Farming School in a nearby town and learning may cool things. Of all the things we talked about, he mentioned he was learning about bees. I was hooked! You may not know this, but high school in Argentina, the country I am from, starts in 8th grade; and depending on the type of school you choose, graduation is at the end of the 12th or 13th grade. At least it was then. So at age 12, I registered and joined another 200 and some boys that lived at the school. Boy, I was in for a surprise! Farming is one of the most difficult and demanding jobs you can undertake, yet probably the one with the most incredible satisfactions you can experience. At age 12 though, most tools of the trade were larger or heavier than me! I learned everything there is to know to run a small to medium-size farm, but out all of the subjects, beekeeping was my passion. I spent as much time I was allowed around the teachers, the hives, and the honey house. If we had a choice where to spend our time, I would always pick to be with the bees. The first 3 years of school, we had 8 hours of bee culture classes and at least 4 hours of field work every week. We had to spend one week of the summer working at the school, my turn was usually around honey harvest time and I would spend a full week working my way through suppers, uncapping and extracting. It didn’t seem work at all! My last year in high school, I partnered with a friend and we became “commercial beekeepers”. We joked about it, as we only had 4 hives, but we were selling honey and that would, in our mind, qualify as a commercial operation. Then it was my turn to do my practice hours before graduation. We had to participate in a real commercial farming operation. 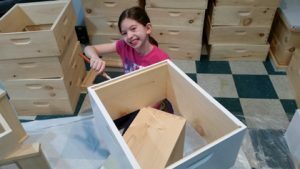 I picked a local commercial beekeeper with about 400 hives. The scale of the operation was incredible to me, and the differences from our school operation of 60 hives and them were noticeable. An incredible learning experience! 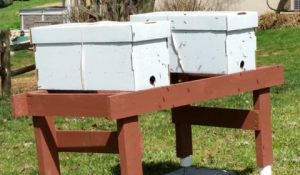 I kept hives for another 3 years after graduating, but then I decided to move to the city and attend college there, and had to sell the hives. The year was 1990. Fast forward to 2015, I had moved to the United States in 2001, got established and started a family when I moved to Ijamsville, MD. Suddenly I found myself with a full acre of lan d. I started to think about bees again. A neighbor mentioned that she was a member of the local bee club and I decided to attend a meeting. It took only that one meeting for me to be back in business. I purchased equipment and ordered nucleus colonies and started to get ready for my new (old) hobby. My 2015 apiary started with 4 colonies and grew to 18 before the first winter. I was about to learn a huge lesson in keeping bees in Maryland. Winter came along, stores were not too high, hives were not too strong and Varroa, an unknown factor in my previous experience was now a huge problem. I lost all the hives before the first snow. I was disappointed. I set to learn what I didn’t know about the bees and beekeeping in my new area and made c hanges and adjustments. The second year was way better. I started the season again with 4 nucleus colonies (there is a reason for that) and built the apiary to 7 before harvest. Harvest was quite good and I entered winter with 10 hives. 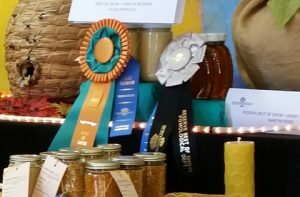 There is a lot to learn still, there is always something you can learn from other experienced beekeepers and a ton you can learn from the bees themselves. That is why we continue to be an active part of our local beekeeper’s club, participate in any educational opportunity around the county and share what we learn with neighbors that want to keep bees. You should join us! If you already keep bees, join the club. If you would like to keep bees, join our workshop. And if you just know that bees are important to humans and would like to help, plant bee friendly flowers, let the dandelion bloom and replace your grass with clover; you will spend less time mowing the lawn, it will look greener longer, and you will be helping a local beekeeper to feed the bees.